Mme PELTIER. 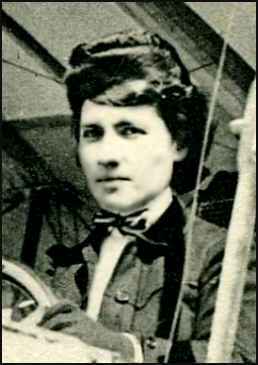 la premiére femme aviateur C.M. Courtesy of Dave Lam, 4-13-06 Thérèse Peltier was a sculptor by profession, and through her friendship with Leon Delagrange (also a popular Parisian sculptor), she became interested in aviation. 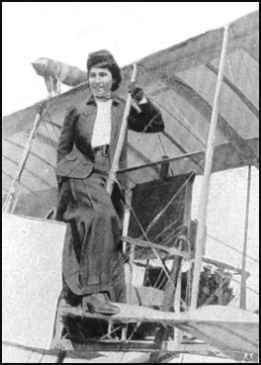 According to most sources, she became the first woman passenger in an airplane, during a flight with Delagrange on 8 July 1908 in which the plane flew 656 feet. (This claim of primacy may be in error-- I have learned that in fact Henri Farman flew an woman passenger, [Mlle P. Van Pottelsberghe] in Ghent Belgium, in late May 1908, as reported in Le Patriote Illustre, 7 June 1908). 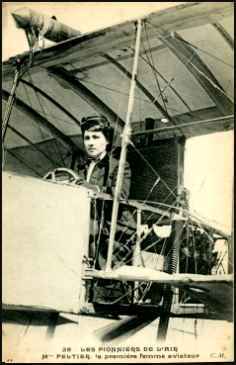 Later, Thérèse also learned to fly herself, and did make a number of solo flights in a Voisin, but she never earned her pilot's license. In 1908, she was a passenger with Delagrange during his successful record attempt for flight duration, during which he flew 30 minutes and 28 seconds. 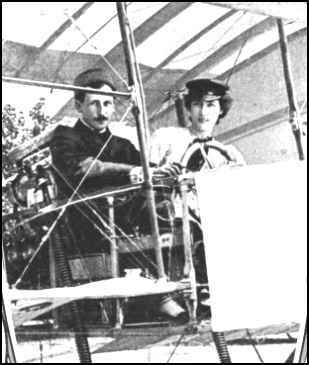 She accompanied him on his successful series of Italian flight exhibitions, including Turin and Rome, during which she reported on his flights for the French newspapers. At one point during this tour, she made a solo flight at the Military Square in Turin, Italy, during which she flew 200 meters at a height of about 2 1/2 meters. In late 1908, Delagrange offered a prize of 1000 francs for the first woman aviator to pilot a plane for one kilometer. 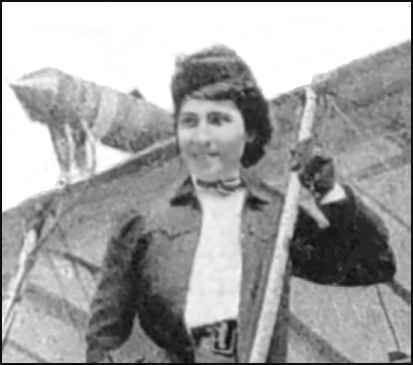 Peltier reportedly began training to compete for the prize, but when Delagrange died in an accident on 4 January 1910 at Bordeaux, she left aviation forever. 999. 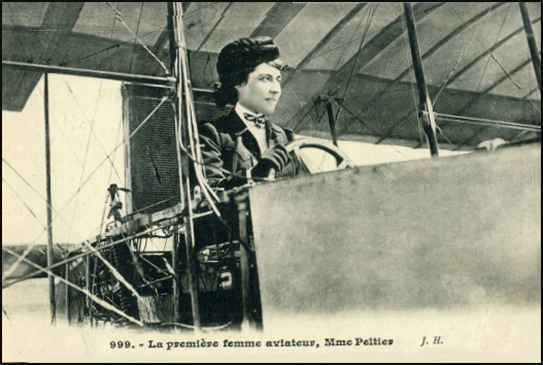 - La première femme aviateur, Mme Peltier J. H.
che ha pilotato l'aeroplano Delagrange (fot. Argus). Thérèse Peltier the first woman flyer..
(4-14-06), you will find about 431 links! However, most of them simply repeat the basic facts of her career, such as those submitted by Dave Lam. Thérèse Peltier died in 1926.